This report is available free to all because it has been superseded by a more recent edition. Economic, political, and market pressures make some development on floodplains inevitable. But appropriate subdivision designs can minimize risks of flood damage — or eliminate them entirely. 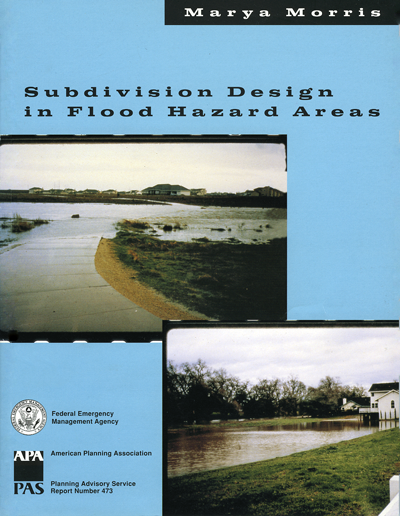 This report explores the full range of planning techniques to minimize possible problems in a flood-hazard area. Cluster development, coast-to-road lots, and elevated buildings are all suggested as techniques that will minimize flood damage. Detailed diagrams illustrate the natural functions of a floodplain and describe the tools used to preserve these functions and protect properties from flooding. Photographs show planners both good and bad planning techniques. Includes appendices with selected ordinances and policies.